I took advantage of my free time this weekend to make another Hoop Travel Bag. I'm using this one to hold my hand piecing stuff for the Sawtooth Star block I showed you last week. 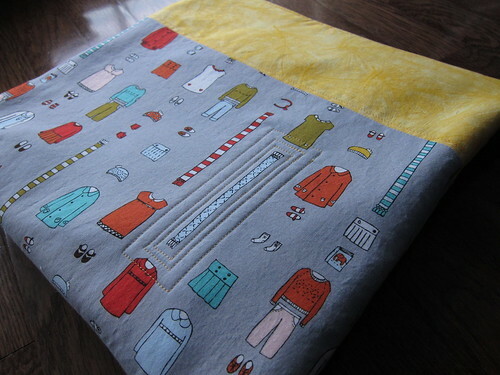 I used some fabric from Aneela Hoey's Little Apples line for the main part of the bag. I added a bit of quilting to the front of the bag to highlight the fabric and add a bit more interest to an otherwise simple project. 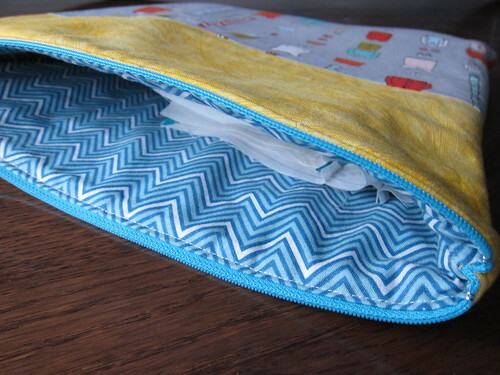 A nice blue chevron print for the lining and a turquoise zipper finished the whole thing off. I love the contrast between the yellow fabric at the top of the bag and that blue zipper. I love this little bag even more than the last one that I made and am glad to have another one of these handy pouches in my crafting arsenal. Nothing like a quick-finish project to cap off another great weekend! Very cute pouch - I like the quilting - it definitely adds that little bit of interest.